A last glimpse of civilization. You might think that a middle-aged man such as myself would have already taken to heart this rather obvious advice, but I should like to reiterate a helpful suggestion, as much for myself as for anyone else. Avoid unfamiliar shortcuts. Especially when you’re walking on a cloudless day when the temperature is 90° and meteorologists are warning everyone that it feels like 98°. Even if you’re traveling within otherwise very familiar territory. I learned this last Wednesday as I set out for my community’s 4th of July parade intending to document our youngest daughter’s debut appearance with her high school marching band. Melinda had told me precisely where she would be in the band formation, and I planned on walking the mile or so down to a corner where I would have a decent vantage point. I arrived before the parade had reached that spot, and rather than stand still among the sweaty populace in the blistering heat, I decided to keep walking along the parade route until I met the advancing marchers. This turned out to be an excellent bit of luck, as it brought me near an underpass that I otherwise would not have thought to surmount. 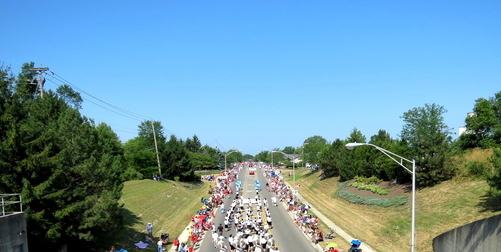 From my vantage point atop the abandoned railroad bed, now a broad path of rubble devoid of tracks, I had a unique perspective of the parade as it passed beneath me. An added bonus was that no one else was up there. Having negotiated the crowded sidewalks before discovering my perch, it was something of a relief to have it to myself. Before long, I saw the band round the corner and come marching toward me, and my enviable view allowed me to fire off a number of potentially good shots. I crunched across the rocks to the other side of the overpass and snapped a few final pictures of the departing band trudging along under a radiant, blue sky. Having accomplished my objective, I gave a sigh of satisfaction and turned to walk home. That’s when the sight of the rail bed extending far into the distance gave me an idea. Suddenly I realized that I didn’t have to weave my way through the crowded sidewalks just to get home. I could follow the rail bed to the first intersecting path that would bring me out beyond the crowd, a nice little detour that would have the added advantage of saving me a little time as well. With any luck, I’d come out near the gas station and be able to quench my increasing thirst, as the unrelenting sun was climbing high. I picked up my feet and clambered over crushed rock in high spirits. Though it was hot and I had to watch my step, I enjoyed being alone on this wide rail bed that cut a long and lonely path through the heart of my town. The distant strains of “You’re a Grand Old Flag” floated along the steamy air as I hiked along and thought about how strange it was that any place so close to home should look so alien. I took off my cap and wiped the sweat from my brow. It was surely one of the hotter Fourths of July. Maybe I would skip the gas station and trot across the street for a frozen mocha frappe. It would all depend on where I emerged from the rail bed, I supposed. Turning my head this way and that, I saw a few things I recognized from this unfamiliar perspective, like the back lot of the municipal building, but not many. I conjured up a mental image of the area as seen from overhead, and I imagined that I was more or less headed in the right direction. In any case, I was sure to eventually stumble out onto a street that I knew. I marveled at how the surrounding greenery created such a strong sense of isolation along the forsaken path. If I were blindfolded and brought to this spot, it occurred to me, I would have no idea where I was. I began to look for footpaths running out to the surrounding properties, but an unbroken line of thick foliage bordered the rail bed. Now all that remained of the parade noise was the fading echo of a drum cadence. It was soon replaced by the gentle rustling of a hot breeze in the nearby trees and spirited birdsong. I began to suspect that perhaps I was not following a shortcut after all. Maybe I was in for a longer walk than if I had just followed the way that I knew. Of course, I could have doubled back and done just that, but now that I had come all this way, that was not an appealing option. I was taking deeper breaths, the sweat was trickling down my back, and I just wanted to get back to the great comfort of my air-conditioned home as soon as possible. There had to be a way off the rail bed soon. Just then I spotted a smaller path diverging to the right and disappearing amid the brush, as promising a lead as I was likely to find. I took the path less traveled, a far narrower passage overgrown with weeds in places. I thought about all of the places where I could have purchased a cold drink that I would have passed by now had I only returned home the way that I had come. The pleasure that I had experienced at the moment I embarked upon this path evaporated, and in its place was the annoying self-taunt of regret. I plowed along, thinking that if ever I were to discover the body of a missing kidnap victim, this was precisely the sort of godforsaken place where I would find it. This was as remote as you could get in my little suburb. And then my narrow path took a little turn and rejoined the rail bed from which I had diverged. There are times when a man knows that he is a fool, confesses his shortcomings, and rues his regretful stupidity, and yet he must endure the consequences of his idiocy. This was one of those times. I knew the general direction in which I needed to go, off to my right, but there had been no break in the barrier of trees and brush. Suddenly I discerned that the way ahead turned to the left. I dropped my preference for an established path off the rail bed. Anything would do, so long as I was physically able to go through it. Shortly afterward I spied a dilapidated barn through the trees, with traffic traveling beyond it. I made my way across an overgrown ditch and emerged on the other side, walking among lost roofing tiles near a small cornfield that I did not recall having seen before. Stepping out to the road, I looked back and forth to get my bearings, and then I realized precisely where I was, which was a farther walk from my house than I would have preferred. I walked into the far side of my neighborhood in a state that was shy of exhaustion but nevertheless quite ragged. I felt as though I had already been through my own little parade and some sadistic squad leader was demanding that I march the route again. I really wasn’t that far from home. But my little “shortcut” had added about a mile to my return walk, and thanks to my complete lack of planning and the oppressive heat, I was desiring hydration as I rarely do. Intensely. Which made this familiar part of my trek seem much longer than it actually was. My own street, for example, seemed to have lengthened in my absence. It took forever to walk by each and every house. As I got closer and closer to home, I could feel my brain slipping out of gear. Once or twice I feared I didn’t even recognize exactly where I was. And then I saw it. Was my house a mirage? It kept receding from me as I approached it, like some maddening Hitchcock device. But at last I reached it, fumbled for the lock and then gloriously inserted myself into the nirvana of 70° conditioned air. I stumbled through the kitchen, filled a glass stein with ice and water, and made a wobbly descent to the basement, where I stood under the active vent, the coolest spot in the house short of shutting oneself in the freezer. I sank into a chair and downed my stein of ice water. Instantly I felt much, much better. One might hope that I also learned my lesson. Given my track record so far, though, I wouldn’t bet on it.